Keith Urban has certainly managed to carve a niche for himself in today’s current country music climate with his own brand of country music. On his latest release, Get Closer, he continues to solidify his foothold and remains firmly ensconced in the contemporary country-pop genre. This latest offering, co-produced by Dan Huff and Urban himself, picks up right where his 2009 release, Defying Gravity, left off. Listeners will already be familiar with the album’s first track and lead-off single, “Put You In A Song,” as it has been a staple on country radio since September. The hit song was co-penned by Urban, Sarah Buxton and fellow Aussie Jedd Hughes. This bouncy summertime romp stills sounds fresh and inviting even in the sub-freezing temperatures of winter, which is a testament to the craftsmanship of Urban’s consistently solid songwriting. Perfectly following the first hit is the radio friendly, “You Gonna Fly,” which continues in the same vein of the up-tempo, feel good tunes Urban is well known for serving up. Although this is one of the few titles presented here not written by Urban himself, with lyrics such as “hop in this truck and run through the red lights/roll down the windows with the radio loud/come on turn it up yeah,” it sounds as if he could have. The energetic “Long Hot Summer,” written by Urban with Richard Marx, makes a great companion piece to the two tracks previously mentioned and easily ranks right up there with some of Urban’s best hits. This song sounds as if it can barely wait to burn up the airwaves next summer. This album also has some stellar ballads, such as “All For You,” and the gorgeous “Right On Back To You,” which includes thunderstorm sound effects that add the perfect touch to this first rate, cozy sounding love song. 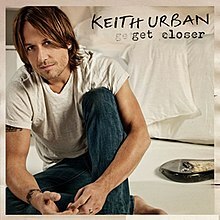 Get Closer is another solid and winning collection that Keith Urban fans are sure to find highly enjoyable. The only downside to the set is its shortness in length. Clocking in at just over 33 minutes with only eight tracks, it seems slightly unfinished. Although brief, the excellent quality of the material included here more than makes up for the short playing time. For listeners who are disturbed by this fact, it is highly recommended to seek out the deluxe version, which contains three bonus tracks and four live recordings, and is readily available exclusively at Target stores.